Lost Island is one of Net Entertainment’s most intriguing creations, and indeed, it’s also one of their most commonly-played games, thanks to the bonus-round potential. The game is based around a mystery island, that features an array of exotic, mysterious, and magical items, and the design of the game is congruent with this theme; the background features mystery buildings of some sort, intertwined in a green forest, while at the forefront of the screen, you’ll see pink flowers blossoming, which spread up each side of the game. 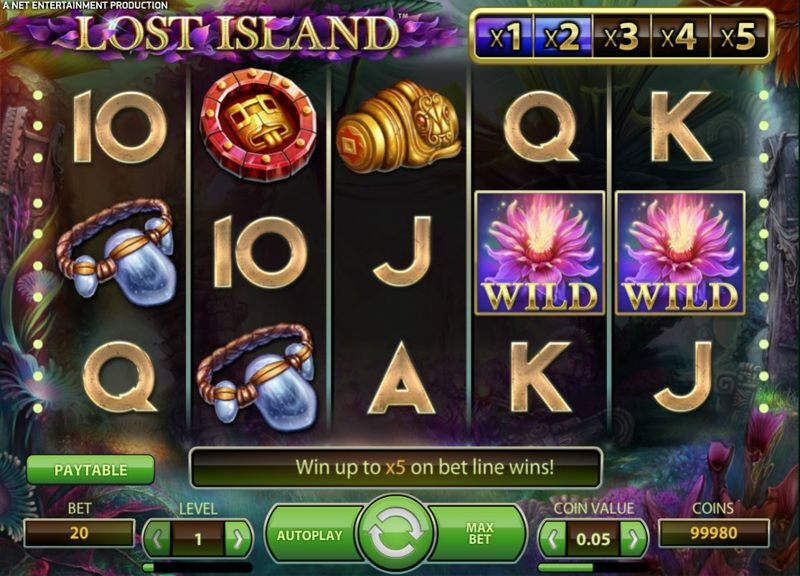 Visually appealing and fun to play, Lost Island has become a player-favourite, thanks to the unique multiplier feature, and the potential of big wins in both the base-game and the bonus-round. 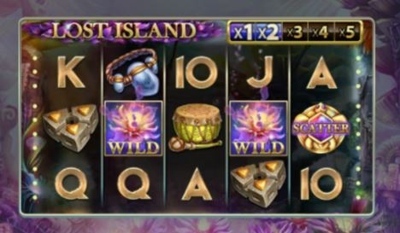 Net Entertainment decided to include two types of symbol in Lost Island; first, you’ll see the playing-card symbols, which are, of course, the low-paying half; the high-paying symbols include strange-looking objects, including some kind of blue Necklace, a handmade Drum, a Statue, and what looks like a modified Sun Dial. There’s also the Wild Symbol, which is a pink flower. Lost Island is unique in the fact that it offers really good chances to win big in the base-game, and this is all thanks to the multiplier action. Each time one of the wild symbols lands on the reels, it increases the multiplier bar at the top-right-hand-corner of the screen. The bar contains 1X, 2X, 3X, 4X, and 5X. So, if you landed two wilds on the reels, all wins are privy to a 2X multiplier, while landing 4 wilds would make everything 4X. This is obviously extremally beneficial, as you can get up to 5X during the base-game – not something that can be said for most slots. 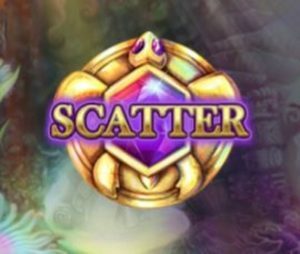 To trigger the free-spins, you’ll need to land three, four, or five of the scatter symbols. Land three, and you’ll be awarded 10 free-spins, while landing four or five awards 20, and 30 free-spins respectively. Now, during the free-spins, the centre symbol (row two, reel 3) is wild, and this sticks in place. Not only does that make winning far easier, as you have a wild symbol on the middle reel, but it also means that the multiplier bar starts at 1X, so you only need to land one additional wild to increase your win multiplier to 2X. During the free-spins, more wild symbols are added to each reel, and the ‘holy grail’ of the game is getting a wild line; 5-of-a-kind wilds, which pays a whopping 2,500X. Obviously, that’s far from common, however, you only need a 3X + multiplier to get big wins from 4-of-a-kind, and if you manage just two or three lucky wins during the bonus, you can easily be looking at a 200X + payday. It’s also possible to re-trigger the free-spins, simply by landing another three or more scatter symbols during the bonus.